1) How much is my home REALLY worth? 2) Is my home REALLY ready to sell? 3) Does my Realtor® REALLY have my best interest at heart? How much is your home really worth? Steve Jacobson is a Realtor® and he is an experienced a professional who is trained to research and understand the market. The rule is that people will buy the less expensive of two comparable properties. It is his job as your Realtor’s® to know what the comparables are and how much they sold for AND how much you can REALLY ask in the current market. It might be that your neighbor sold their home, which is exactly like yours, six months ago for $X amount and you want to ask $X or more. If the market is cooling off you most likely won’t get $X. You will have to ask for $Y instead. Yes, $Y is less, but it is an HONEST evaluation of your home in the market. In the housing market, like any other market, worth is based on the law of supply and demand. More houses on the market and higher interest rates (AKA “The Cost of Money”) will lower what a home owner can ask for their property. Conversely, fewer homes and a lower interest rate will increase what an owner can ask. It is up to your Realtor® to know what the trend is and decide accordingly how best to advise you. It is human nature to think that what we have is worth more than it really is due to the fact that we have an emotional attachment to our homes. We raised our children and dreamed our dreams there, but in the end houses are simply bricks, wood and concrete. Try to let go and see your house as it REALLY is. Let Steve, as you real estate professional, show you the real worth of your home through honest evaluation. Is your home ready to sell? Wow! That’s a loaded question. Anyone can sell anything, in any condition, at any time, for a price. The idea here is to get the very highest price we can! Your home is a personal living space. It looks like you, smells like you and it even feels like you. That’s the way homes should be…while you are living there. When the time comes to sell, the time has come for the ‘you’ in the house to fade in to the background. It is time for the home to look new and inviting to any and all who may come to view it. REMEMBER: You Never Get a Second Chance to Make a First Impression! The ‘curb appeal’ that your home offers a prospective buyer is EXTREMELY important. Light-People react more favorably to a home shown under bright light. Color-Neutral and light! Avoid highly textured or patterned wallpaper. If you have either of these consider removing it and re-painting with a neutral color. Sound-Avoid sounds that will be distracting: vacuums, lawn mowers, banging pipes, barking dogs and noisy children. Light music in the background can be a nice touch. Smell-We react more to scent and smell than to any of our other senses. This can work for or against you! The smell of newness, cleanliness and citrus are the most favorable in selling a home. A dish of vanilla in a warm oven can give the aroma of baking cookies! And who doesn’t like that? Avoid the smells of tobacco, pet odors, cooking oil or gas. Don’t smoke in the house if you can help it! Many people are allergic to smoke! Strong cooking odors are a turn off. Avoid cooking fish in the house if at all possible. Small details are a BIG deal! People want to view and buy a property they perceive as having been well cared for. The following are a few small and large details to help you improve your chances of a full price offer! Begin with your exterior. Mow, fertilize, and weed the lawns and garden. Plant or place flowers in the beds or on the patio. Neatly trim all the trees and bushes. Always remove snow and ice from walks and drives. The front door is your welcome sign to a person coming to your home for the first time. Be sure the front door and walk are clean and appealing. Add a seasonal decoration for an inviting touch. If the exterior need a fresh coat of paint…paint it! There is nothing that can make your home look more lack luster and uninviting than the dull and dingy look of cracked, faded and peeling paint. Choose neutral colors, please. You may love Bronco Orange or Steeler Gold, but you can bet the buyers (not to mention the neighbors) won’t. Don’t forget to paint mend or stain the fence! Sparkling bathrooms will help you sell your home. Every inch of the tile, grouting, and stainless should shine like the day it was made! It should all be free of soap scum, mildew, dirt and grime. If the caulk is stained, mildewed or damaged repair or replace it. Fixtures should be free of water spots and polished up. If there is a window, open it up to allow fresh air to flow through. Place a fresh vase of flowers on the vanity. Replace the old toilet seat with a new one. Try to replace any out dated light fixtures with newer updated versions. Check to be sure the counter tops are not old, worn or stained. Place ALL PERSONAL items out of sight. Put out fresh towels. Clean up that Kitchen! Many buyers will judge the amount of housekeeping they will need to do based on the condition of the oven, stove and the refrigerator. Make these as clean and shiny as possible inside and out. Clean the interior of your dishwasher, removing stains, especially on the door. Clean and organize your cabinets and pack away unnecessary items. The counters should be clean and free of clutter as well. Remove small appliances such as toasters, blenders, electric can openers and coffee makers. Show off your counter space! Avoid clutter-Buyers have a hard time looking past the clutter to the beauty of your home. Remove items you seldom use. Let people see the space you have to offer. Don’t leave toys out or clutter on the stairs. These little things can be distracting!! Make the closets look as big as possible. Remove items that can be packed or stored elsewhere. Closets that appear neat and organized seem larger and more enticing to buyers. Don’t leave anything on the floor! The brighter the better! In the living room, clean the windows and open the drapes to highlight the walls and ceiling. By letting in the natural light you let the buyers see how bright and cheery your home can be. When showing at night be sure to turn on as many lights as you can so that it appears as if it were day. The bedroom can be a make it or break it area in your home. Make sure the bedrooms are ABSOULTELY spotless! Clean the rugs and wash the windows. 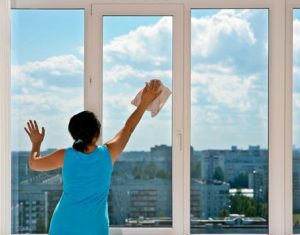 Dust all the surfaces and wipe off the window sills. If you know you have a showing, make up the bed as if it were for a guest. If you are able, purchase fresh flowers to brighten up the room. Hide TV and computer chords if you have these items in your room. It can make the area look disheveled. If you have a basement, it can be a dead give away to the true condition of your home. If you just threw all of your knick-knacks and such in the basement to hide them, I hope you remembered to ORGANIZE THEM! Be sure not to skip out on cleaning the basement if it is used for storage. Check the sump pump if you have one. Be sure all of the lights are working and the light bulbs are burning. Check for rodent intrusion and correct the problem ASAP! Clean it up and call the exterminator right away. Don’t wait! The last thing you want is rodent droppings ruining a showing or scraing off a potential buyer! All of the above also apply to the garage as well and don’t forget to clean up the oil stains! CLEANING CONCRETE: Cleaning the oil from your concrete garage and drivewasy: Cover the oil stain with a layer of a clay-based cat litter or sawdust. Allow the cat litter or sawdust sufficient time to soak up the oil, which could take a day or more. Completely sweep the concrete free of the litter or sawdust and dispose of it properly. If the stain is still present, scrub it with a solution of detergent and water using a nylon scrub brush. Rinse thoroughly. Dry concrete also makes a good agent to absorb oil stains when used in conjunction with cat litter. Allow the litter to absorb the surface oil, sweep away the oil soaked litter and then spread a good covering of dry cement over the stain and let it sit on the surface for a day or so. The dry concrete will actually absorb the stain right out of the surface of the driveway. Be careful of weather conditions, as rain will cause the dry concrete to solidify. Older oil stains that have penetrated the surface of the concrete are much harder to remove. Follow the above procedures to soak up the surface oil. Make a paste of two parts hydrated lime powder and one part turpentine. Spread the paste over the surface of the remaining oil stain covering a larger patch than the actual stain. Cover the stain with plastic sheeting to help prevent the turpentine from evaporating. Leave the poultice covering on the stain overnight. Scrape off the paste and follow with a good scrubbing of detergent and water. You may need to repeat this poultice procedure as more of the stain leaches up to the surface of the concrete. HAVE YOUR HOME PROFESSIONALLY DEEP CLEANED! What you think is clean will look different in the eye of the buyer and a professional housekeeper. Cleanliness is subliminal. Surface clean can never make up for deep down clean. Baseboards, faucets, sliding glass door tracks, doors and door jams, window sills, cobwebs, under and behind furniture, walls (if not freshly painted) and kitchen appliances all need to be cleaned to give a potential buyer that deep down feel of cleanliness and freshness. Make sure all surfaces are free of dust and debris. If by chance you smoke in your home please remove the ashtrays from sight. Caution: Wear and tear makes buyers uneasy! Faded and scraped walls, as well as scratched woodwork should be restored to good condition. A little paint and furniture polish can go a long way! Buyers tend to estimate repairs for anything a bit high. The less they see to repair the more they can offer for your home. If the carpet is wearing thin or is stained you can clean it, cover it or replace it. It will sell faster and closer to your asking price if you replace it if at all possible. It will always cost you less in the long run to replace it before you put it on the market. Once again the buyer will tend to over estimate the cost of replacement. Tend to small cracks in every room in the house. Major appliance repair is something that very few prospective buyers would look forward to. Have your heating and cooling system check, fixed and certified by a licensed professional. Do the same with the roof. It is a wise idea to have a home inspection done long before you put your home on the market. This can get you to the closing table much faster! Check Minor Repairs It’s the little things that can lose the sale or lose the potential money in an offer! If the ceiling fan hasn’t worked right for years and you are used to its funny little quirks, buyers aren’t as easy to over look them. If the toilet runs on, change the plug. If the faucet is leaky, replace it. Bottom line is to fix all the little annoying things that have been on that Honey Do list for years. The thing is this, buyers are looking for the easiest to move into, cheapest to buy, best deal in town. It’s our job, as a team, to see to it that that is exactly what the buyer thinks about your house. It will take some elbow grease, but I promise in the end it will be time and effort well spent. Does My Realtor® REALLY have my best interest at heart? AS for your Realtor®, I can only tell you this: He is not only LEGALLY and ETHICALLY obligated to have your best interest at heart, but Steve REALLY does. Helping people buy and sell the most precious possession they will ever or have ever owned is like a sacred duty to him. Our team promises to do the very best job we know how to do. We will be as informative and as up-front as we can be with you about all of the issues that accompany the confusing world of Real Estate. REMEMBER: There is no such thing as a stupid question!!! !